Sometimes an opportunity presents and you just have to run with it. Liisa Turunen is coming to teach for us! I am so excited. 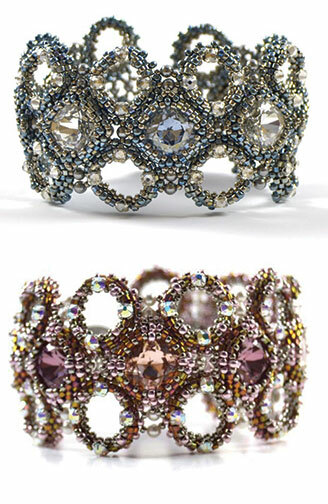 All of her beadwork designs are gorgeous and so much fun. She loves beads and she loves cats so in my book, that’s a match made in Bedecked and Beadazzled heaven. She has been designing and teaching full time since 2006! All of her designs are gorgeous. Each prettier than the next. She is going to be passing through the area in mid August so why not have a class. You know I love all things beady and I love classes so a few emails later and we have a plan. Description: Stitch an intricate, wide bracelet with open rings and settings for sparkling crystals that will be a great addition to your beaded jewelry collection. Students will Learn: How to create solid beaded rings that are embellished; connecting and working open spaces to create a setting for crystal stones. Prerequisites: Comfortable with peyote stitch. Materials in Kit: Swarovski stones, pearls, rose montees; magnetic rhinestone clasp; cylinder beads; Japanese seed beads; One-G thread; beading needles. 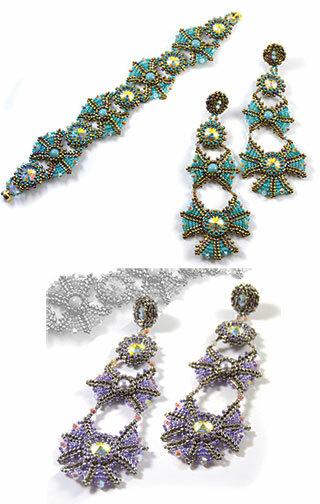 Description: Stitch a fun set of long dramatic earrings that are very lightweight, along with a matching bracelet. Students will Learn: How to stitch around pearls and embellish fans; how to bezel and connect stones. Prerequisites: Experience with peyote stitch. Materials in Kit: Japanese seed beads; Swarovski stones, bicones, pearls; cylinder beads; One-G thread; beading needles; magnetic clasp; earring posts. Give us a call at 410.296.0405 to sign up. This is going to be such a fun class. Hope to see you here!